SNAFU! : Malaysian Army bets on Miniguns for its "Anti-Invasion" Force! Malaysian Army bets on Miniguns for its "Anti-Invasion" Force! The "anti invasion" capability of the Malaysian Army is correspondingly increased because the weight of fire and accuracy of Malaysian infantry is substantially enhanced, thanks to the miniguns. When augmented by 40mm automatic grenade launchers and RPGs fielded as anti-infantry weapons, such firepower is devastating noteworthy. Whether in an ambush, meeting engagement, deliberate attack or block force operations, the amount of firepower Malaysian infantry can deliver in a shootout could potentially rattle soldiers coming under fire for the first time. It is important not to overlook the psychological effect of a first clash that provokes a fierce reaction against an intruder's soldiers. 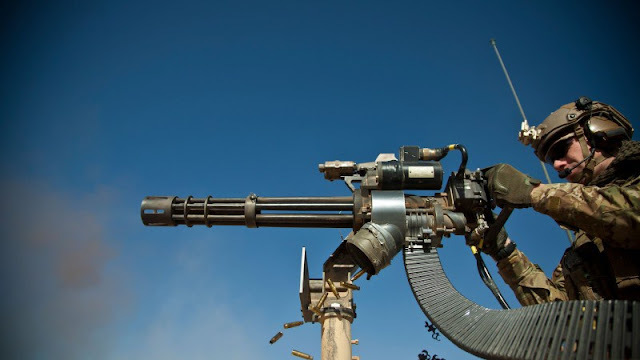 The minigun is thus a misnomer as there is certainly nothing "mini" about the deluge of aimed, sustained, automatic fire minigun operators can bring to bear against their target. Malaysian defence planners probably reasoned that when its infantry is sent into operations against an intruder who controls the skies, and one with an advantage in armoured platforms and guided munitions, Malaysian infantry must have what it takes to deliver the heaviest possible firepower when targets are in sight and within range. Interesting. I've wondered why miniguns haven't showed up more and it seems like Malaysia is taking the lead. This seems like a no brainer for ground combat but for some reason we haven't seen them used on armored vehicles in the anti-personnel role until now.